Dear Karina, thank you for this truthful insight on Joy. How true it is, we must have our focus right. I really liked your example of the “Roses and Thorns”, lots of wisdom there. God bless you mightily dear one as you bless others with your insightful posts. You are so welcome 🙂 Thank you for reading and lovely comment. God Bless you abundantly. Before I preached in a church service in Chinhoyi, Zimbabwe, the congregation – a tent full of men, women, teens, and children – stood and sang one last song. These were the people I had been ministering to during the day, the very same people who had showed me their one-room homes, their dirt floors, their pitiful conditions, and their lack of belongings. Yet, while far more poor than the Western standard for poverty, these people stood there and sang, “Every hour, every day, You are faithful, Oh Lord!” Their praise was an indictment against so many of us who have far more, yet still complain, as if to say, “God has not provided like He promised.” Shame on us for not praising Him even in our bad times, for He is worthy, regardless! And, He is faithful! Rejoice for the good new. Blessing to You Karina . “Focus on the rose.” Beautiful post, very timely for me, Karina. Thank you! Your are welcome, sister Lilka. God Bless. Karina, wonderful message which means a lot to me! I share my poems because when he gifted me with that ability, the words I heard were ‘Simply given, simply received’, share freely with all! I said Lord who will read it, I cannot write well, not like great writers and poets who will read it? You receive from my spirit, so many will embrace what you share, for their spirits are hungry just like yours! I am beset by many illnesses, MS, COPD, Costochondritis, Fibromyalgia, extreme arthritis, ulnar nerve palsy…and much more. People I meet when I am at the hospitals or Dr’s offices say how do you make it through your day…I simply ask “with God.” He promised me that he would give no more than what i could bear…and I believed him at his word! And each day I awaken with a smile and share with all whom I meet that I know an awesome love who will never let you down! And he is a life-changer! My body of flesh may be fading but my spirit is so strong and getting stronger every day. I look to the heavens each day for His return…and I know he loves me because He told me so. I have had many issues with my computer, and have no visit much with everyone but know You are embraced daily in my prayers and love…and always with spiritual hugs! Your words were a wonderful nourishment for me, my sister! Thanks for their healing touch!!! Your are welcome 🙂 Thank you very much for sharing a part of your life’s story. Take you into our prayer here. God bless you, brother. I meant to say …I make it with God! God bless! Amen-Amein Sister in Christ Jesus-Yeshua Katrina!! I agree with you, we all have problems with health and pain sometimes!! Thank you very much 🙂 I will definitely pray for your prayer requests 🙂 God Bless. Hi, sis! Some excellent points in your post as always. It can be hard for some to keep up their faith during sorrow, but we need to remind ourselves that the evil one plays tricks with our minds in times of distress. We must remember we are with God at all times, because He is always with us! Thank you very much for always put a wonderful comment on my post 🙂 Pray all is well with you too,brother. Have a nice weekend. God Bless. Good evening, Karin. All is going well enough. I am just going through the steps of getting insurance authorization to take the next steps for my cancer treatments. It really is quite an undertaking here in the U.S.
You are welcome as always for any comment I can make, sis. We have shared a number of comments over the past two to three years or so. Your posts and guest posts are always so good! Hope you are doing well. Have a great evening and day tomorrow! Keep pray for you,brother ) Let God will make easy way to you. Have a blessed day. I pray for His healing hand over me each day. I hope it is His will…and to bless me with His grace to forgive my sins. Yes that is right. Your thought is so true. Thank you very much for the sweet comment,sist. God Bless and have blessed Sunday. Never has it been based on our ability to rejoice in suffering: Christ’s Spirit in us has always been the One filling our hearts with joy, knowing fully well that as long as we’re in this world, our physical bodies are subject to such threatening moments. Nevertheless, our earthly bodies will fade away and our spirits will live on with Jesus forever, undisturbed by suffering and shame. Thank you very much for you wonderful thought on my post. I really love your statement: our earthly bodies will fade away but our spirit will live on with Jesus forever. Once again thank you very much. God bless. Eternal life is to know Him. This knowledge lives within our hearts, forever. Troubles come and troubles go. But that Holy Spirit knowledge always remains within. Such is the confidence of a true believer. Thank you Karina for reminding us. You are welcome ..I also thank you for your great thought on my post 🙂 Have a blessed weekend. You are welcome..:) Thank you for your lovely response..God Bless. Always good to know you are reading my posts. It’s like a visit from a faraway friend. Thank you very much:) God Bless. Thank you very much for the Bible verses, your lovely comment on my post, and also your prayer:) God Bless to you too. Paul is an excellent example of rejoicing in the Lord under difficult times. Very good post! Thank you very much for reading my post, follow me, also for your lovely comment. 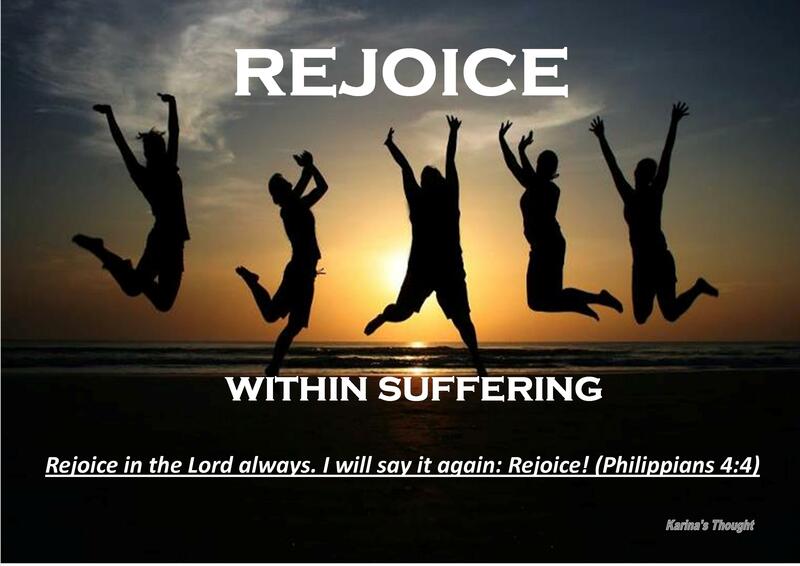 Yes, Paul is a great example of rejoicing within suffering. Thank you and God Bless. What a very nice reply. I hope we can visit and share many more things of God as we go along. You are so welcome 🙂 Thank you for taking your time to read my post. God Bless. The only good thing I found in my suffering, be it my epileptic disorder and loss of dear ones, is I felt the need to be closer with Christ. First of all thank you very much for your comment. Ye it’s so true! No matter in suffering or not, we have to always close to God 🙂 Thank you very much. God bless and happy weekend. Yes. if it is closer to God, much much better. It can go the other way round. So, let us keep praying for others. There is continuous need for believers to be assured and reassured that favourable earthly circumstances are not the reasons for rejoicing in the Lord. Rather, the joy is rooted in Who God is and should be our experience all day long. Just got to know your blog. I hope to keep in touch, hence, I am following your blog right away. I hope you keep in touch too☺. Thank you very much for visiting and following my blog. It was a great honor to me 🙂 Yes I definitely will visit and follow you back. Thank you for your lovely insight too. God Bless. Thanks for your kind response and for the follow too. Amen!! Yes we will see our beloved in our Father’s home in Heaven. Thank you very much for read again my post,sister Anna. Happy belated Thanksgiving to you.. God Bless.